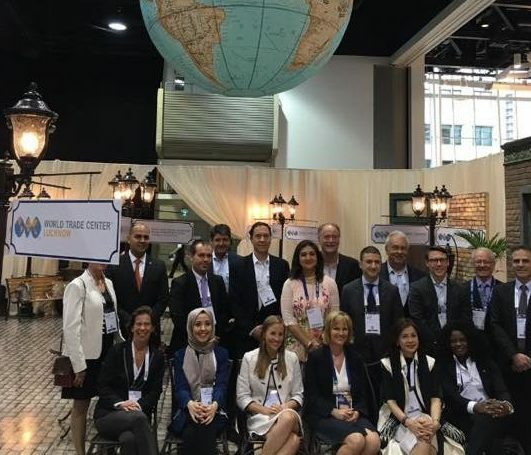 In 2016, World Trade Center Savannah (WTCSav) led a delegation to the business-to-business matchmaking forum and trade show, Centrallia 2016 in Winnipeg, Manitoba, Canada. The purpose of participating in Centrallia 2016 was to honor a reciprocal agreement made with World Trade Centre Winnipeg (WTC Winnipeg) following the business delegation they led to the Coastal Georgia region in April, as well as to establish and further develop relationships between the Coastal Georgia region and Canada. Centrallia is designed specifically for businesses seeking new opportunities in Canada and throughout the world. The format is simple and effective: each company receives up to fourteen 30-minute meetings with potential partners of their choice. The full program includes targeted one-on-one meetings, a conference component with excellent speakers, a trade show, meals and networking events. Centrallia 2016 brought together approximately 550 participants from over 20 countries. The delegation from WTCSav included Joe Steffen, Legal Counsel of Savannah State University, Jason Coley, Regional Project Manager of Georgia Power Company and Dell Keith, Executive Director of the Wayne County Industrial Development Authority. In addition to participating in Centrallia 2016, delegates were hosted by Duraco Windows & Doors, a Winnipeg-based windows and doors manufacturer. Duraco attended the business delegation in Coastal Georgia a month prior. The company shared both cultural and industrial focuses with the delegation through a guided tour of the Canadian Museum of Human Rights and a tour of their own manufacturing facility. Delegates from WTCSav were able to better understand the Winnipeg, Manitoba region as well as build upon the existing relationships established during the April inbound business delegation.